This is the list of the major codes I've written for astrophysics research. They will be publicly available soon. The TESS code solves the equations of relativistic magnetohydrodynamics using a moving Voronoi mesh. The idea is based on the moving-mesh cosmology code AREPO, but TESS is more general in that it can solve arbitrary hyperbolic systems, such as relativistic hydrodynamics. 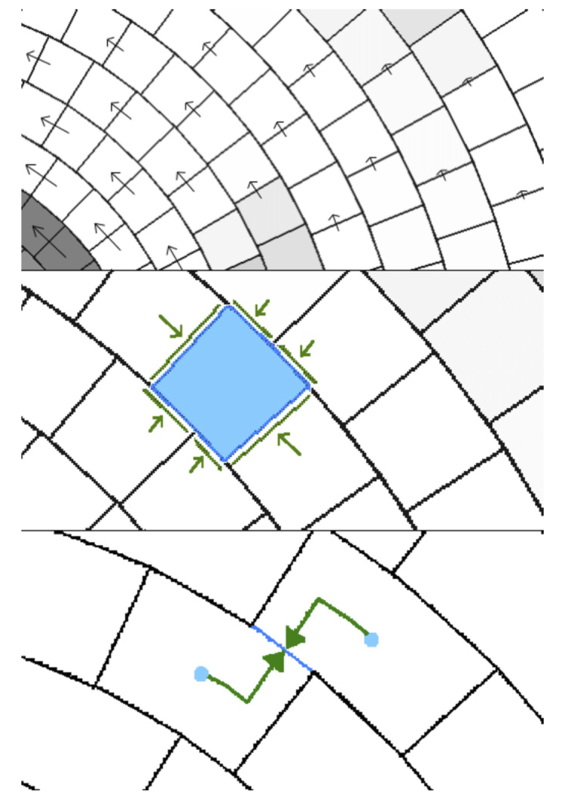 The general idea is to use a Voronoi Tessellation to define the computational zones. 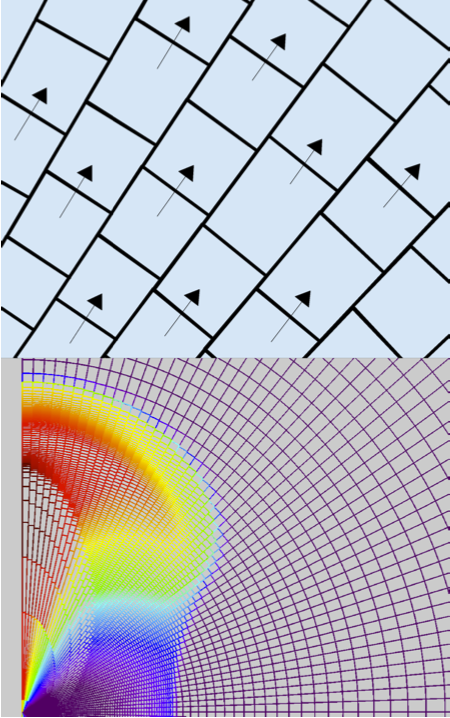 The points which generate the tessellation can be moved during the course of the calculation, which causes the zones to move and change their shape and size to match the motion of the underlying flow. 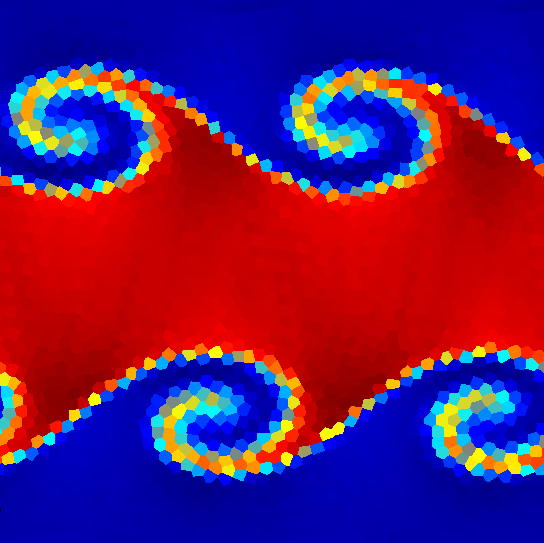 Moving meshes are useful for problems which include cold supersonic flows, or flows for which it is important to minimize diffusion across contact discontinuities. Voronoi meshes have been demonstrated to be very useful for cosmological simulations. I have begun to apply TESS to binary star systems, with application to white dwarf mergers. TESS is also potentially useful for simulating tidal disruption events. The Voronoi mesh is very useful if the flow in question is complicated, or its large-scale properties are not known at runtime. For gaseous disks, however, the large-scale flow is quite simple -- fluid elements are essentially in circular Keplerian motion. Therefore, for disks the generality of the Voronoi tessellation may be overkill. For such problems I have designed the moving mesh code DISCO, which is not Voronoi, but instead specifically tailored to the circular Keplerian motion. DISCO's mesh is a cylindrical grid which shears azimuthally with the flow. Because many astrophysical disks are cold and attain Mach 20 and above, subtracting off this supersonic orbital motion can be essential to capture less obvious details in the flow. DISCO is well-suited to studies of planet formation due to the long timescales, supersonic flows, and subtle planet-disk interactions involved. DISCO has also been applied to circumbinary disks, for which it gains a similar advantage. DISCO is also being used to study accretion disks, in particular quasi-periodic oscillations. My third code, JET, is specifically tailored to radial outflows. JET employs a spherical polar grid whose cells can move and shear radially with the flow. It has a very similar structure to DISCO, but the direction of the shearing is changed from azimuthal to radial. As its name suggests, JET is designed to solve problems involving relativistic jets. In its 1D form, it functions as an extremely accurate spherical Lagrangian hydro code. In multi-D, it behaves like a series of 1D Lagrangian codes which are coupled laterally by transverse fluxes. Another advantage of the JET code is that the boundaries can also be moved during the calculation. Doing so allows for calculations over tremendous dynamic range; the flow can expand over ten orders of magnitude, yet we can place grid zones to cover half an order of magnitude at any one time. In this way, each order of magnitude of the expansion takes the same number of CPU hours to calculate.